The 1966 Aston Martin DB5 Convertible in 'Vantage' specification was the highest price car of the sale, selling for £1,524,700. Adding all-important Hollywood sparkle to the event, the ex-Sir Peter Ustinov 1962 DB4 Series IV Vantage Convertible, sold for almost the same amount at £1,513,500. Further sale highlights include a "James Bond" style 1964 Aston Martin DB5 4.2-Liter Sports Saloon, which was sold for £595,100. 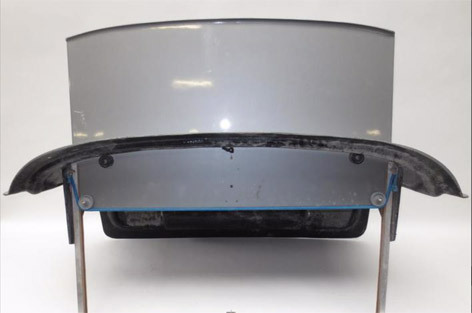 An interesting lot is number 84, an Aston Martin DB 5 “Bullet Proof Shield” boot panel unit, for display purposes only. 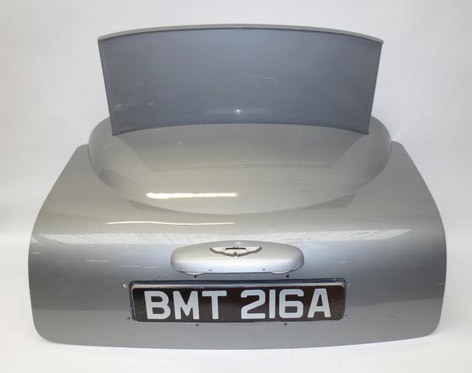 A fibreglass boot panel finished in light grey (some surface marks and scratches), with simple bungee and latch mechanism operating ‘pop-up’ plastic ‘shield’ (split to top left corner), as featured in the film Goldfinger fitted to James Bond’s ‘Special Equipment’ DB5, with rotating licence plate prism fitted with two license plates including ‘BMT 216A’, and lighting unit with enamel badge. 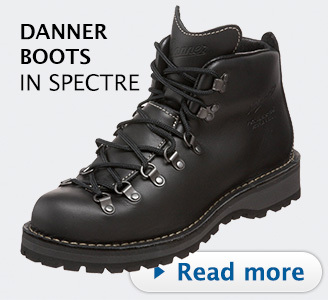 The whole boot panel unit measures 110cm wide overall. 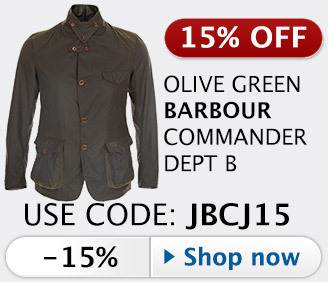 Expected sale price: £250 - 350 (€340 - 480) but it sold for £687 (€959 / $1080). 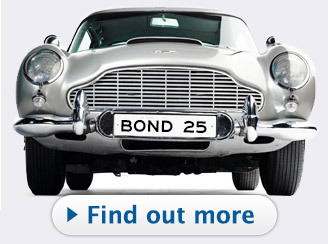 Two signed James Bond photographs featuring the Aston Martin DB5, comprising a monochrome image of Sean Connery as 007 and signed by the actor in black marker, 25 x 20cm, the other a colour image of Daniel Craig as 007 with Judi Dench as ‘M’, initialled ‘DG’ and signed by Dench, 20 x 26cm, each mounted, framed and glazed and with certificates of authenticity. 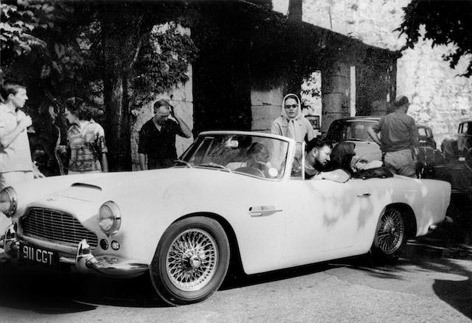 A signed photograph of Sean Connery with the Aston Martin DB5, colour image of the actor as James Bond 007 leaning on the door of the famed DB5, signed by Connery ‘Best Wishes...’ in black marker, 25 x 19cm, mounted, framed and glazed. A large photograph of Sean Connery with the Goldfinger Aston Martin DB5 with three signatures, colour image of Connery as James Bond 007 with the DB5 at Stoke Poges Golf Club, 59 x 90cm, mounted together with autographs of Ian Fleming, David Brown and Sean Connery, framed and glazed, measuring 83 x 111cm overall. 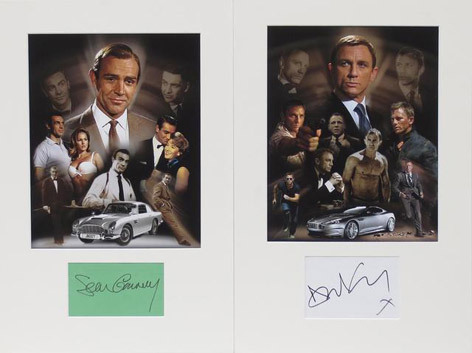 Two James Bond montages featuring Aston Martin with signatures of Sean Connery and Daniel Craig as James Bond, each colour montage image depicting Connery and Craig as 007 in scenes from the films, featuring the DB5 and the DBS V12 respectively, each mounted together with signature of the corresponding actor, each approximately 49 x 33cm overall. 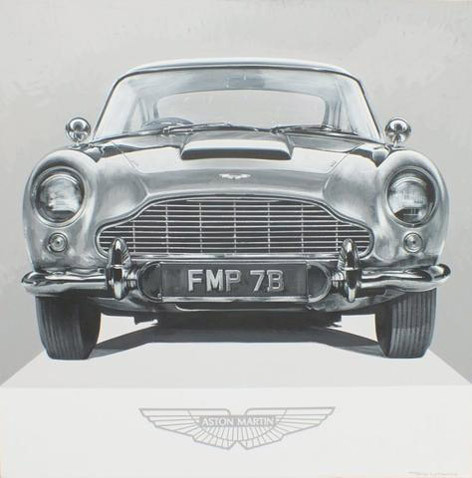 Tony Upson, ‘James Bond Aston Martin DB5’, signed, acrylic on canvas, a front view of the car as driven by Sean Connery as 007 in the Goldfinger and Thunderball films, 104 x 140cm. 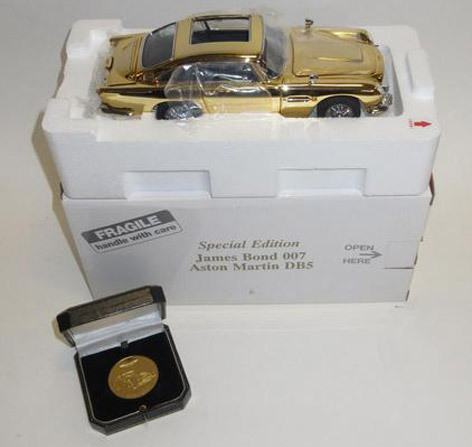 A special edition ‘gold plated’ James Bond 007 Aston Martin DB5 model and Aston Martin medal in presentation case. Precision engineered 1:24 scale die-cast metal, constructed from more than 300 parts exclusively by the Danbury Mint, the main body, bonnet, boot and ejector panel are 22ct gold plated, in original packing, roof panel and ejector seat still sealed unopened as new condition, features telephone concealed in the driver’s door, leather seats, rotating number plates, bullet-proof shield, tyre slashers, battering rams, machine guns, the bonnet lifts to scale model engine bay, with box, together with an Aston Martin 1954 - 2007 commemorative medal in a presentation box. 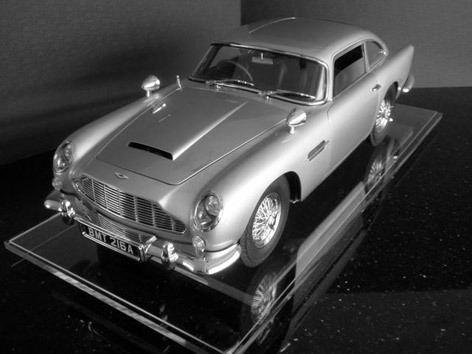 A 1:8 scale model of the James Bond Goldfinger Aston Martin DB5, kit-built, constructed from mainly metal parts, originally licensed by both Eon Productions and Aston Martin Lagonda Limited, well detailed model with opening doors, bonnet and boot, loaded with all the Bond ‘Special Equipment’ including machine guns, bullet shield, removable roof section, cutting spinners, and finely modelled interior, approximately 60cm long, mounted on a Perspex plinth within an etched display case. 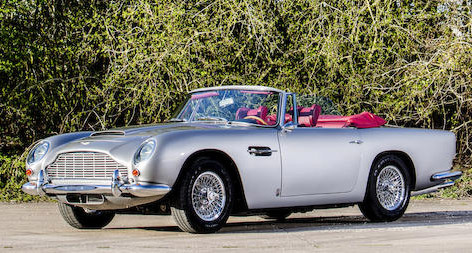 This beautiful silver Aston Martin DB5, lot 211 (see image below) sold for £595,100 (€830,681 / $935,782). 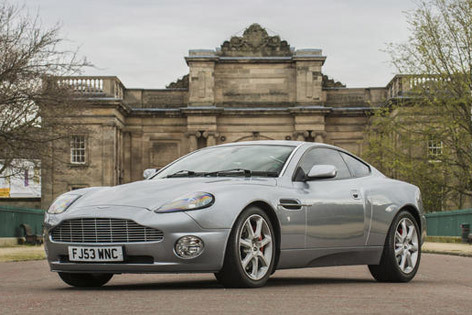 The most affordable but also one of the most beautiful Bond models is this silver 2004 Aston Martin Vanquish, which sold for £79,900 (€111,529 or $125,600). Barn find and project cars sold well, with a brace of 1958 Aston Martin DB Mark III Sports Saloons selling particularly well, one selling at twice top estimate, achieving £104,540, and the other at £115,740. 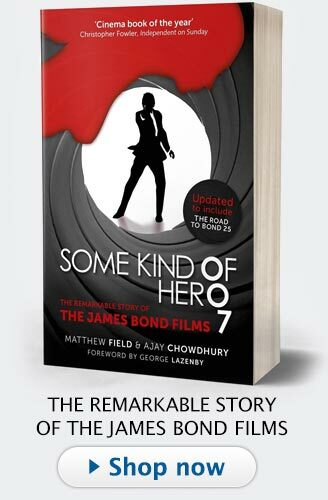 The DB Mark III is arguably the first ‘James Bond’ Aston Martin, appearing in Ian Fleming’s novel Goldfinger. "As pioneers of the single-marque sale, we've returned to the Works Service here in Newport Pagnell for another great auction, exceeding all previous year's totals, with £10.3 million of motor cars sold," said Bonhams UK Head of Motor Cars. "The quintessentially British marque of Aston Martin attracts interest from enthusiasts across the world, a fact demonstrated here today as we took bids from all corners of the globe. 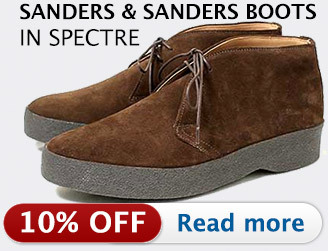 This year's sale attracted a larger and more cosmopolitan than ever before, achieving an excellent result. 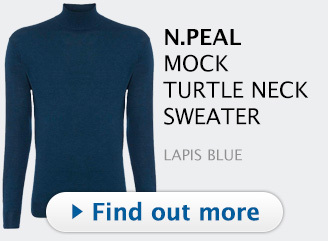 "The market demonstrated that there is a ready appetite for exceptional examples, even for models that had previously been regarded as not particularly fashionable. The result we achieved for a Virage Coupe illustrated this with £74,300 realized for the stunning 1990 model." Barn find and project cars continued to demonstrate their popularity, with the 1958 Aston Martin DB Mark III Sports Saloon selling at twice top estimate, achieving £104,540, and a 1959 Aston Martin DB Mark III Sports Saloon soaring above top estimate, selling for £115,740. Paul Spires, Commercial Director at Aston Martin Works, said: "Today's Aston Martin Sale has been another hugely memorable occasion with keen bidding, strong sales, and rare and collectable Aston Martin sports cars going to buyers around the world. 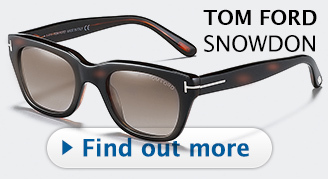 "Despite the mixed weather there was a superbly sociable 'garden party' atmosphere among the 2,000 or so Bonhams guests who joined us here today – enjoying the sale and helping us to celebrate our 60 years in fine style." 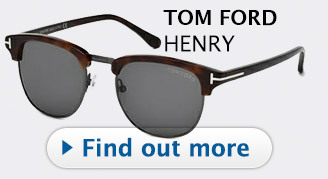 For a video of a restoration of an Aston Martin DB5 at Aston Martin Works, see Mr. Porter's article "Aston Martin DB5".